BERJAYA Land Bhd (BLand) is building the world’s biggest integrated mall complex estimated to be worth about RM7.5 billion on a 32ha site in China’s Hebei Province, its chief said. Called Great Mall of China, the 18.5 million sq ft development, which is similar to the concept of Berjaya Times Square in Kuala Lumpur, is expected to be completed within the next five years, said BLand chief executive officer Datuk Francis Ng Sooi Lin. Once completed, the project will feature more than two million sq ft of retail space, two hotels, two serviced apartments, office towers, convention centre, theatre and a parking complex. There will also be an indoor monorail, three theme parks and acquarium. 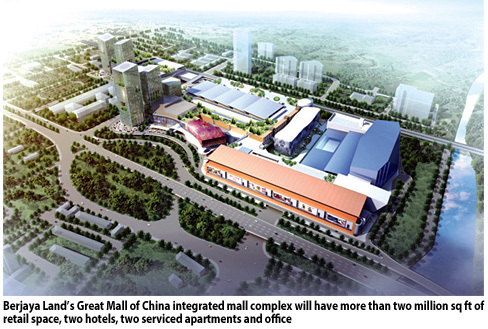 Berjaya Great Mall of China Co Ltd (BGMOC), a 51 per cent subsidiary of BLand, is undertaking the development. mall, each with one million sq ft of space, an extreme park, a family park and a water park, as well as parking facilities. Ng said the gross development cost for phase one was estimated at RM1.5 billion. One development, Ng said in an interview with Business Times. “We are quite confident we can carry out Phase One without loans. By August, we will open for sale around 540,000 sq ft of space at the retail mall and hope to rake in some RM750 million in gross development value,” Ng said. He said BLand would retain the remaining 460,000 million sq ft of retail space and the one million sq ft pedestrian mall for recurring income. Currently, the world’s biggest mall is The Dubai Mall in United Arab Emirates, with a built-up area of 12.1 million sq ft. Selling point: Soo showing the model of Taman Pulai Hijauan. He expects the project to get good response from house buyers. JOHOR BARU: Property developer Hua Yang Bhd is confident that the affordability of the its products would attract prospective house buyers. Johor branch manager Soo Kim Hiang said the company expected its Taman Pulai Hijauan project to receive good response from the public. “On the average our residential properties in Johor Baru are priced between RM250,000 and RM400,000 and this is our strong selling point,” he told StarBiz. Soo said although the township project was located within Iskandar Malaysia, the company’s price was much lower compared with other on-going projects in the economic growth corridor. He said this at the launch of the 225 double-storey Alder Residences terrace houses under the phase one of Taman Pulai Hijauan township along KM27, Skudai-Pontian Highway. The four-bedroom and three-bathroom house within a gated precinct has a built-up area of area of 170.34 sq m (1,834 sq ft) and is priced from RM250,000. Soo said a similar property with the same floor area in other parts of Iskandar Malaysia, especially in the Nusajaya area, was priced from RM400,000 each. The 56.65ha (140 acres) township comprised of 1,400 double-storey terrace, cluster and semi-detached houses and commercial properties. “The project has a gross development value of RM380mil and will keep us busy for the next five to seven years,” he said. The company was looking at first time house buyers and upgraders from nearby old housing estates in Pontian, Pekan Nenas, Senai and Gelang Patah for Taman Pulai Hijauan. 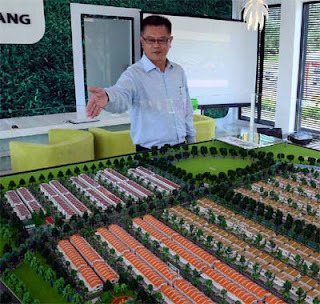 Hua Yang currently has an ongoing project, Taman Pulai Indah which is a mixed development of 4,942 residential and commercial units on a 193.03ha (476.98ha) site. About 134.35ha (331.98ha) has been developed since 2000, and it would take three to five years to fully develop the remaining area with a gross development value of RM818mil. 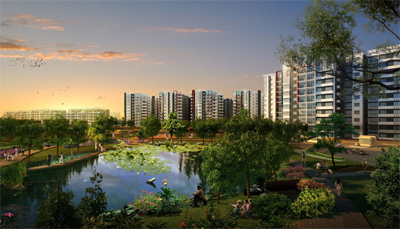 SHAH ALAM: Property developer SP Setia Bhd will unveil its maiden project in Singapore called 18 Woodsville via a simultaneous launch in Kuala Lumpur, Singapore and Jakarta this weekend. This is the first time that SP Setia is doing such a simultaneous launch for a development. In a statement, SP Setia said the simultaneous launch would be done in real time where interested purchasers would know exactly which units had been booked or were still available, regardless of which of the three cities they were in. “We are confident that 18 Woodsville would be an attractive proposition for Asean investors,” said SP Setia president and chief executive officer Tan Sri Liew Kee Sin. The freehold 18 Woodsville consists of a 15-storey block with 101 units, and offers one, two and three-bedroom units with sizes ranging from 495 to 915 sq ft. Prices start from S$1,500 (RM3,677) to S$1,950 (RM4,779) per sq ft. The 18 Woodsville project is located near the Potong Pasir mass rapid transit (MRT) station and several colleges and schools, and offers easy accessibility to Orchard Road as well as connectivity via the Central and Pan Island expressways. The simultaneous launch will be held at SP Setia's sales gallery in Singapore located next to the Potong Pasir MRT station, the JW Marriott Hotel in Kuala Lumpur, and the Grand Hyatt in Jakarta. Those attending the simultaneous launch are entitled to special discounts, which are made available only for this weekend's launch. By the railway: Prasarana’s second property project will be located on two-acre near the monorail station in Brickfield. PETALING JAYA: Syarikat Prasarana Negara Bhd’s second property development project will be located on a two-acre site near the monorail station at Jalan Tun Sambanthan in Brickfields. Group managing director Datuk Shahril Mokhtar said although there was an abandoned building on the land in question, Prasarana planned to carry out a mixed development project. “Although the area is not that big, it is worth developing as it is sitting on prime land. The tender will be out next month,” he told reporters after a site visit of the light rail transit (LRT) extension project by Land Public Transport Commission chairman Tan Sri Syed Hamid Albar yesterday. Going forward, Prasarana has identified a few locations for possible property projects along its Ampang and Kelana Jaya lines. Prasarana’s first property development along its rail line was on the site of the Dang Wangi LRT station which has a gross development value of about RM220mil. A joint-venture between Crest Builder Holdings Bhd’s unit Crest Builder International Sdn Bhd and Detik Utuh Sdn Bhd has won the bid to develop the 2.72-acre area into a mixed commercial development comprising a retail mall, premium serviced residential suites, a hotel and offices above the underground LRT station. On the LRT extension projects, Shahril said the contract to build the Putra Heights depot would be awarded this week. “The remaining three contracts comprised of the system for Ampang Line, the card access system for Kelana Jaya Line into Ampang Line and the development of station 10 and 11 for the Ampang Line will be awarded in a month or two. “The total contract value for the remaining four contracts is about RM1bil,” he said. 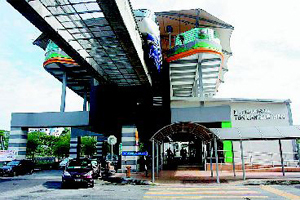 Prasarana has awarded contracts worth RM4.5bil for the extension project to-date. On its rolling stock for the two LRT lines, Shahril said for the purchase of 14 sets of new four-car train, refurbishment and the coupling of the current two-car set into a four car set would cost no less than RM500mil. “For Ampang Line, we have awarded a contract to a Chinese company to build 20 sets of six-car train. We are in final negotiations stage,” he said. Prasarana is a wholly-owned Government company established by the Finance Ministry, to facilitate, undertake and expedite public infrastructure projects.